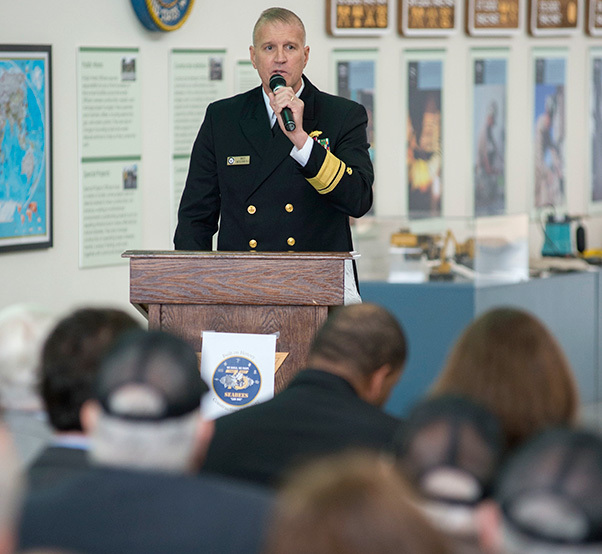 Rear Adm. Bret Muilenburg, the commander of Naval Facilities Engineering Command (NAVFAC) and Chief of the Civil Engineer Corps, addresses the audience at the Seabees 75th Anniversary Kickoff Ceremony. The event at the Seabee Museum marked the start of celebrations commemorating the 75th Anniversary of the U.S. Navy Seabees, 150th Anniversary of the Civil Engineer Corps, and the 175th Anniversary of NAVFAC in 2017. U.S. Navy Seabees from around Naval Base Ventura County gathered at the Seabee Museum at Port Hueneme, Calif., Jan. 18, 2017, to kick off a series of celebrations throughout 2017 to commemorate the 75th anniversary of the creation of the Naval Construction Force, March 5, 1942. 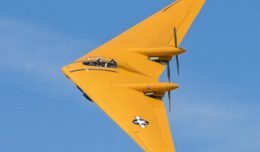 The event also marked the start of celebrations recognizing the 150th anniversary of the U.S. Navy’s Civil Engineer Corps, as well as the 175th Anniversary of Naval Facilities Engineering Command this year. In attendance were Rear Adm. Bret Muilenburg, commander, NAVFAC and chief of civil engineers; retired Rear Adm. David Nash, chairman, Seabee Historical Foundation; retired Rear Adm. Samuel Cox, director, Naval History and Heritage Command; Lara Godbille, Seabee Museum director; Capt. Mike Saum, commodore, Naval Construction Group (NCG) 1; Capt. Jeffrey Kilian, commodore, 30th Naval Construction Regiment; and many other distinguished guests and Seabee veterans. Providing the opening remarks for the ceremony, Muilenburg spoke about the contributions Seabees have made throughout each American conflict since the Naval Construction Force’s founding. Muilenburg also took time to recognize active and retired Seabee veterans in attendance, and he thanked individuals and organizations which have contributed to the Seabee legacy. A painting titled “We Build, We Fight” by artist James Dietz was unveiled, and attendees enjoyed a dramatic solo performance of “The Complete History of the Seabees (abridged)” by Joseph Gallo. Utilitiesman 1st Class Jennifer Neal, whose portrait was depicted along with other Seabees in the painting by Dietz, spoke about the honor of being included, as well as her own contributions to Seabee history. Also during the event, retired Carpenter’s Mate 1st Class Macy Coffin, a World War II Seabee veteran and the oldest Seabee in attendance, joined Construction Mechanic Constructionman Recruit Andrew Staple — the youngest Seabee — along with museum director Godbille and other event participants in the unveiling of a new gallery at the museum illustrating the historical contributions of the Seabees during World War II, as well as during the Cold War. At the conclusion of the ceremony, guests were invited for a behind-the-scenes tour of the museum’s collection. The Seabees were created March 5th, 1942, after then Rear Adm. Ben Moreell, chief of the Navy’s Bureau of Yards and Docks, recognized the need for a militarized construction force. Following the attack on Pearl Harbor, the Navy approved the formation of the first naval construction battalions. Naval Facilities Engineering Command, established in 1842, is the Navy’s oldest systems command. The Navy Civil Engineer Corps was established in 1867 following the Civil War.